30 years after everyone else and prompted by the publicity associated by the recent Citizens Theatre production, I got around to reading Alasdair Gray’s novel Lanark. For some reason, I found myself treating it not as a 2015 reader but as if transported back to the 1980s period of its original publication. Therefore, liking it in the way that I might have done when I was closer in age to the art student Duncan Thaw and was gaining an empathy and experience of Glasgow akin to his. Perhaps this is because of the prose’s similarities to George Orwell whom I was reading quite a lot at that time in the run up to the year of 1984. Perhaps because I was reading from the 1982 paperback edition recently bought second-hand. James Joyce is more often quoted as an influence in Lanark, but it was definitely the influence of Orwell’s 1984 which I detected in Gray’s depiction of the dystopian Unthank in the first section, Book Three. For example, the post-war youth social scene evoked by the Elite Café and arthouse films, the trams and horse-drawn milk carts in foggy streets, the references to 18 and 22 o’clock. Later in Book Four, we have references to the political structures of “council” and “assembly” and the Government posters with advice and photos of leaders . Gray’s predictions of how society might develop after 1981 are intriguing. He anticipates libraries which prefer music and films to books, stronger health warnings on cigarettes, the increase in both the popularity and the social respectability of gambling, financial credit considered as valuable as cash, the use of human-like robots, a serious housing shortage leading to primitive public hygiene, political tensions between different levels of government. Gray was long credited with the political rallying cry, “work as if you live in the early days of a better nation” (although he later clarified it was borrowed from Canadian poet Dennis Lee). Lanark contains several other statements of similar challenging tone. Duncan Thaw’s father says, “ It isn’t the loud men on platforms but the obscure toilers who change things”. The young Lanark himself hopes for a job where “(he) kept useful services working properly” and, later, older with some public experience, he is certain that “the world is only improved by people who do ordinary jobs and refuse to be bullied”. Gray’s illustrations are a deservedly famous part of the book, and the text includes some informative references to art. Duncan Thaw’s unfinished mural in the Cowlairs church is said to be influenced by the “Trinity Altarpiece” by Hugo Van Der Groes and the work of Pierre Puvis de Chavannes. 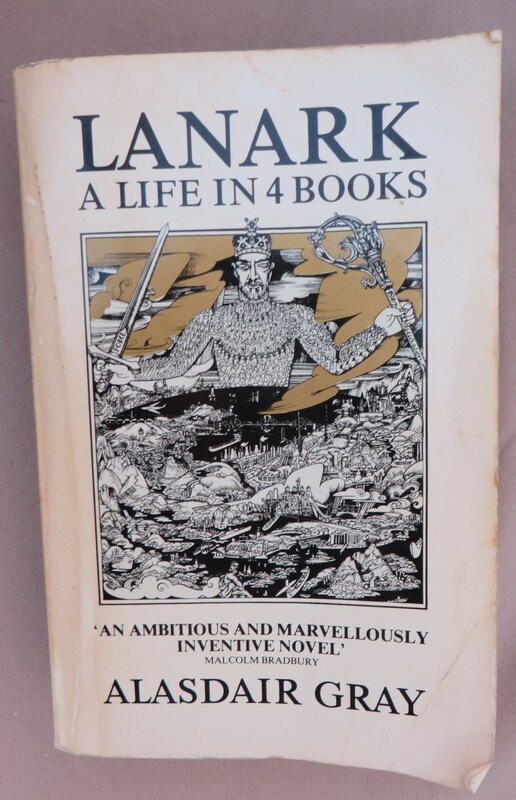 Alasdair Gray’s cover illustration for the original paperback edition of “Lanark”. 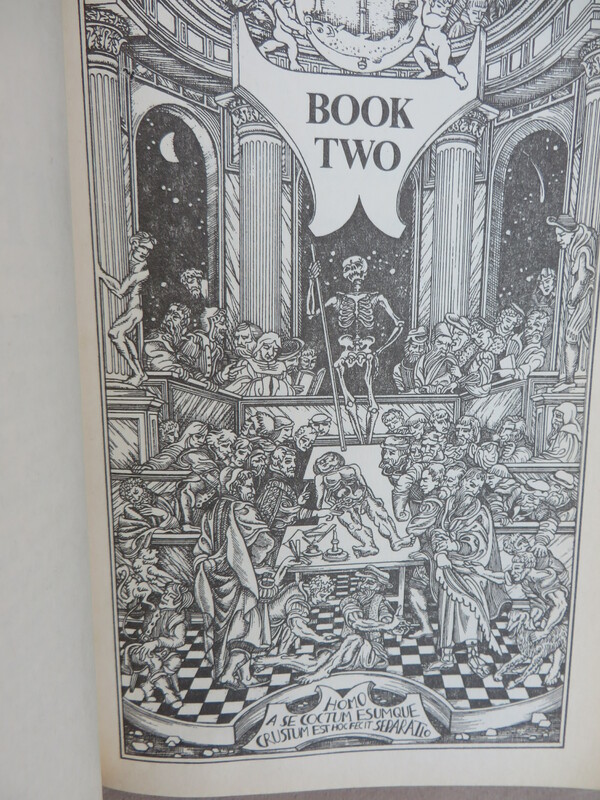 Another Alasdair Gray illustration from “Lanark”. 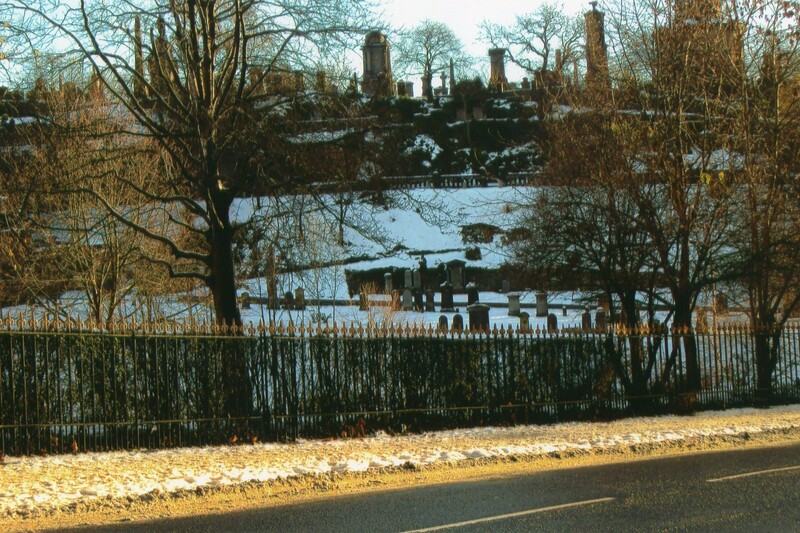 The Necropolis, Glasgow’s imposing Victorian cemetery, a location in “Lanark”. Glasgow Cathedral is a place of accommodation for some of the people of Unthank in “Lanark”. 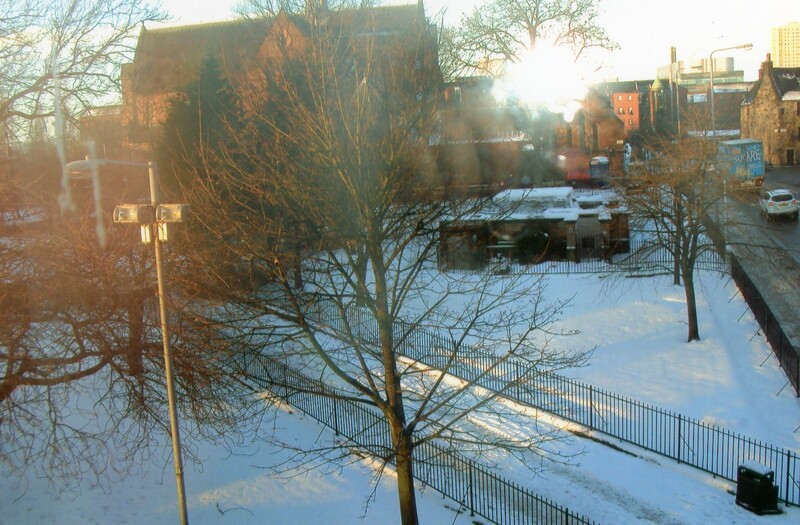 These two photographs were taken on an unusually snowy day in 2010. Which arts centre took its name from Buddhist philosophy? This year marks the 40th anniversary of the setting up of the Third Eye Centre in Glasgow. 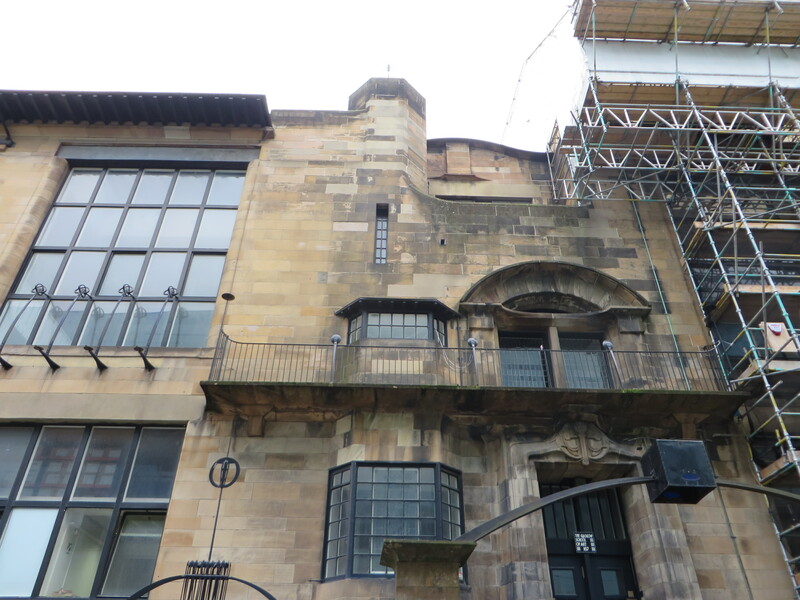 A multi-purpose centre of art gallery, performance space and bookshop within Alexander “Greek” Thomson’s imposing Grecian Chambers, it was a formative location in my artistic education during the 1980s. Its shop-front space without an overbearing staff presence meant that you felt you could call in on a whim and stroll around for ten minutes at a time without self-consciousness. Its front bookshop was especially enticing, crammed with newspapers and magazines covering all aspects of the arts, culture and politics as well as a wide range of fiction and non-fiction. This old photo ignites nostalgia. The music concert at the forefront of my memory is Richard and Linda Thompson, but Max Reinhardt on Late Junction has just prompted my recall of the wonderful acappella of the Mint Juleps one Mayfest. I also remember the reading by Seamus Heaney which was preceded by traditional singer Ted Hickey, and a performance of another kind in the stand-up comedy of Simon Fanshawe and Jenny Eclair. This was a golden age of touring theatre and the Third Eye was, alongside the Tron and the Mitchell theatres, an important Glasgow platform for small productions. While there were many I read about with interest and missed with regret, the only one I actually saw was a double bill of short Beckett plays by a tiny local company called the Great Western Theatre Company. The Third Eye was a major partner in at least two Glasgow festivals of art and culture from Russia and eastern Europe as the continent redrew boundaries at the end of the 1980s. These events were successful artistically but not always financially, and this latter fact led to the closure of the venue around 1990 or 1991 – at the very time of the European City of Culture success towards which it had been such an important contributor. When the building reopened a year or two later, its new name, the Centre of Contemporary Arts, sounded so plain, so half-hearted, that its future seemed unpromising. Yet, as it has turned out , the life of the CCA has been longer than that of the Third Eye Centre. Refurbishment included expansion into adjoining premises, arts events of varying kinds were presented and thrived. The spirit of the Third Eye Centre has lived on…plus it has an excellent cafe/restaurant of the classic arts centre type with an arty name! It was great to find further archive material from the web-site of the short-lived Glasgow Miracle Project. More forthcoming from other sources one day, perhaps. One of my favourite websites is Hidden Glasgow. Unfortunately I can’t identify it as such on the right hand side because it was designed ten years ago in an earlier website era, and modern technology precludes. Although its appearance is now a bit old-fashioned, it still contains large amounts of fascinating information, photographs and discussion on Glasgow architecture and history. Its proprietors are hoping to update it this year. How the old working-class areas of British cities have been changed, and have often vanished, through modernisation and gentrification is a familiar theme of our 20th century history, and Hidden Glasgow contributes just as significantly as do Spitalfields Life and The Secret History of Our Streets.